We are happy to announce an upcoming SURJ webinar: “David Gilbert and SURJ: The Necessity of Cross-Class Organizing to end White Supremacy.” The webinar will take place on Monday, July 23 from 8:00-9:30pm EST/ 5:00-6:30 PST. Register for the webinar, here. This webinar is part of SURJ’s series of book and film study groups. As part of the webinar we will also launch a study guide to help groups and individuals dive into David Gilbert’s new short book, Looking at the U.S. White Working Class Historically. You can participate in this webinar by calling in by phone or a video call through the computer. Here is the facebook event for this webinar: https://www.facebook.com/events/257000221738788/?ti=ia. 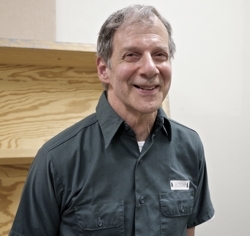 Special recorded message from David Gilbert, who is a longtime anti-racist and anti-imperialist who has been held as a political prisoner in New York State since 1981. A much longer bio for David can be found here: http://prisonersolidarity.net/prisoner/david-gilbert. Clarissa Rogers is Operations & Finance Coordinator at Showing Up for Racial Justice. Her organizing has been deeply inspired by the work of David Gilbert and other political prisoners. She is a white working-class prison abolitionist and long-time political prisoner supporter who has worked with the Human Rights Coalition, Anarchist Black Cross, Jericho Movement, the Free Maroon Shoatz Collective & Decarcerate PA. She frequently collaborates with prisoners and political prisoners, including Jerome Coffey from HRC’s Advisory Board. She believes that the struggle for racial justice can be won by engaging in education passionately, organizing strategically, and healing our communities transformatively and that the struggle can be a wacky adventure full of joy and fun, even in a world that routinely breaks our hearts. Netdahe Williams Stoddard “I currently co-direct StandUp!, which is a program under the umbrella of WonderArtsVt, a local non-profit founded in 2014 by co-director Rachel Wilson. StandUp! works to create structures of support and safe spaces for racially (and otherwise) targeted youth in our local 7-12 grade schools. We work with the broader student body, teachers and administrators toward racial literacy, a more inclusive curriculum and historically accurate narrative. We also engage directly with the student perpetrators of racist/sexist/homo-and transphobic behaviors with a mission to change their minds, not just their actions. I also currently co-facilitate workshops with the Peace and Justice Center in Burlington, Vermont with a focus on building empathy and recognizing and addressing racism in our communities. I pay my bills these last 20+ years primarily as a builder, landscaper and forestry worker and I use everyday of it to engage my fellow workers in discussions of privilege, racism and history.” Netdahe is the son of the late political prisoner Richard Williams. Moderated by Carla F. Wallace, longtime activist in Kentucky and founding member of Showing Up for Racial Justice (SURJ). She was part of the successful Fairness Campaign to include sexual orientation and gender identity as protected classes under Louisville’s Human Rights Ordinance. Carla helped establish the Audre Lorde Chair in Race, Class, Gender and Sexuality at the University of Louisville and co-chairs the Community Council of the University’s Anne Braden Institute for Social Justice Research. <https://louisville.edu/braden> The late visionary white anti-racist organizer Anne Braden called Ms. Wallace one of the best civil rights organizers Louisville produced during the 20th century. This webinar will also serve as the launch for the study guide “David Gilbert and SURJ: The Necessity of Cross-Class Organizing to end White Supremacy” which is a companion for David’s new book: Looking at the U.S. White Working Class Historically.